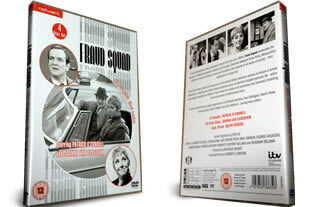 Fraud Squad DVD set. The complete First series on 4 dvd's. DELIVERED FREE IN THE UK. Fraud Squad is a well known police drama from the late 1960s that follows the adventures of Detective Inspector Gamble and his aide, Detective Sergeant Vicky Hicks, Metropolitan officers on the footsteps of the con-men and fraudsters who operate at all levels of society - from boardroom to bingo hall. Fraud Squad was memorable for being one of the earliest British television dramas to feature a female detective in a leading role, while some storylines focus on Gamble's complicated personal life - which sometimes threatens his efforts to hunt down the sharks (and sometimes the minnows) inhabiting the murky world of international fraud. This first series features guest appearances by Michael Gambon, Andrew Sachs, Derek Fowlds ,Paul Eddington, Martin Shaw, and Colin Welland - among many others.